Organic traffic remains one of the most important channels for website traffic and thus SEO one of the most important tools to grow your site. Not everyone is well versed in this area. Fortunately for us WordPress users, there are SEO plugins to help us out. By far the two most popular options are Yoast SEO (formerly known as WordPress SEO by Yoast) and All-in-One SEO Pack. Both of them do a really good job at making WordPress websites search engine friendly. Yet, which one should you pick? The decision between Yoast SEO and All-in-One SEO Pack is one that almost every WordPresser will face and the source of many online discussions. To make it easier, in this article, we will take an in-depth look at both Yoast SEO and All-in-One SEO Pack to point out their differences as well as pros and cons. In the end, you will have all the information you need to make a decision which WordPress SEO plugin is the right one to propel your site forward in the search results. Sounds good? Then let’s start with why you should use an SEO plugin in the first place. Why do you even need any of these plugins? Doesn’t everyone always say how great WordPress is for search engine optimization? If so, shouldn’t the platform take care of all things SEO by itself? It’s true that WordPress is a very search engine friendly out of the box. The CMS builds structurally sound websites that are easy for search engines to browse and understand. That way, just using WordPress takes care of 80 percent of all technical SEO. In addition to that, the platform has SEO features like pretty permalinks and the ability to change the site title and tag line for further effect. So, in order to be properly indexed by Google, you don’t necessarily need an SEO plugin. This is especially true if you use an SEO-optimized theme like Genesis framework. However, SEO plugins let your take site optimization a few steps further, specifically on-page SEO. They do so by giving you almost complete control over how your content will appear not only in search engine results but also in social networks. In addition to that, these plugins can help you greatly in producing optimized content that is much more likely to rank high. In short, the benefit of using an SEO plugin is that it takes care of the other 20 percent of search engine optimization and gives your site the extra bump to play in the top leagues. The two plugins we are looking at in this post are not only the leading SEO plugins for WordPress, they are also among the most popular WordPress plugins of all time. Both Yoast SEO and All-in-One SEO Pack can boast more than one million active installs. Quite impressive, right? All-in-One SEO Pack is the older of the two. The plugin was created in 2007 by Michael Torbert and Steve Mortiboy and is part of the portfolio of Semper plugins. Over time it has accumulated a massive user base and can claim over 27 million downloads to its name. Yoast SEO, on the other hand, was created by Joost de Valk in 2010 (back when it was still called WordPress SEO by Yoast) and quickly became the other big name in the WordPress SEO sphere. By now, it has edged ahead of its main competitor with north of 29 million downloads.As should be obvious from these numbers, both plugins deserve to be at the top. As should be obvious from these numbers, both plugins deserve to be at the top. They are jam packed with powerful features that help rack up the SEO performance of WordPress websites and are both trusted by millions of users. Either one will greatly benefit your site, yet there are differences. After getting the facts and hard numbers, it’s time to look at our two SEO plugins and compare them on a number of markers. Since SEO is a complex field that not everyone knows about, one of the main goals of a good SEO plugin is to make things simple for its users. Even beginners need to be able to implement SEO measures without a lot of background knowledge. Let’s first see how our two plugins fare in this regard. Both Yoast SEO and All-in-One SEO Pack are installed and activated like any other plugin. Just go to Plugins > Install New, search for the name and click on Install Now. Done. The setting section itself is divided into several pages with different tabs that divide all options by category. Here, you can change a lot about the kind of information your site will share to search engines and how it is provided from title structure and indexation rules for posts, pages, and archives to social presences belonging to your website and more. The tour will already explain a lot, however, if something is still unclear, you can always access the on-screen help. Here you will learn everything necessary to properly configure your SEO settings via short screencast videos. However, overall the plugin’s default settings are already very good. Yoast SEO makes up for a lot of the shortcomings of the WordPress platform; for example, it eliminates a lot of duplicate content by excluding subpages of archives from being indexed. As a result, most users won’t have to change much and even if they do, the plugin makes it easy for people of any level of knowledge to start optimizing their site. The installation of our second plugin also goes the familiar route. Once finished, you will find a new menu item on the WordPress dashboard. Clicking on it takes you to the settings’ page. 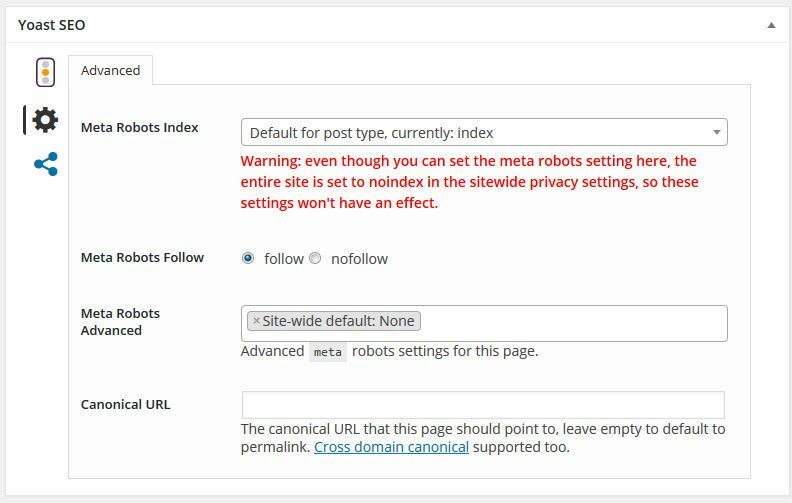 In contrast to Yoast SEO, All-in-One SEO Pack has all of its standard settings on one single page. While this can be a little overwhelming at first, many users appreciate that they don’t have to click through several different menus to get where they want. The plugin also comes with nice little details like an option to automatically capitalize titles. While this won’t make or break your SEO, it’s nice to have. For beginner users, every option also comes with its own help icon. When you click it, you get a short description of what the setting does and sometimes a link to the help section. In addition to that, the menu also contains links to the support section with documentation, support forums (premium users only), video tutorials and a beginners guide. 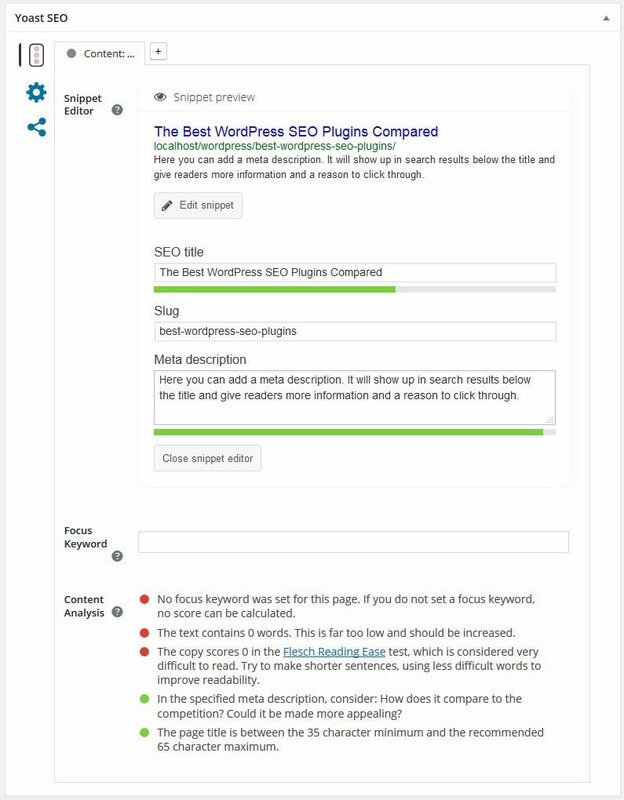 Both plugins that we are testing come with loads of options for improving your site’s SEO. While setup can be a little overwhelming (unless you have a detailed guide like this one for Yoast SEO), they try their best to go easy on you and help where they can. I personally like Yoast SEO’s user interface a little better as it feels cleaner and more organized. However, overall both candidates do a splendid job. You might be aware that SEO is no longer only about search engines. Social platforms with millions of users are also commonly used for content discovery and work as alternative search engines that can bring in droves of traffic. Any SEO plugin worth its salt needs to address this. Yoast SEO has an entire section devoted to social network optimization. Users can add up to eight different social networks so Google knows they belong to your site (one of which, for some reason, is Myspace — is that a thing again?). In addition to that, you can add Open Graph meta data for Facebook, Twitter, Pinterest, and Google+. That way, social platforms will understand exactly what your content is about and which is the title, image, URL, description, and more so they can display everything correctly when it is shared. Furthermore, as you will see below, this can also be enhanced on a per-post basis with custom images, titles, and descriptions. All-in-One SEO Pack also has a lot to offer in this area, however, to take advantage of it, you first need to activate Social Meta in the Feature Manager menu. 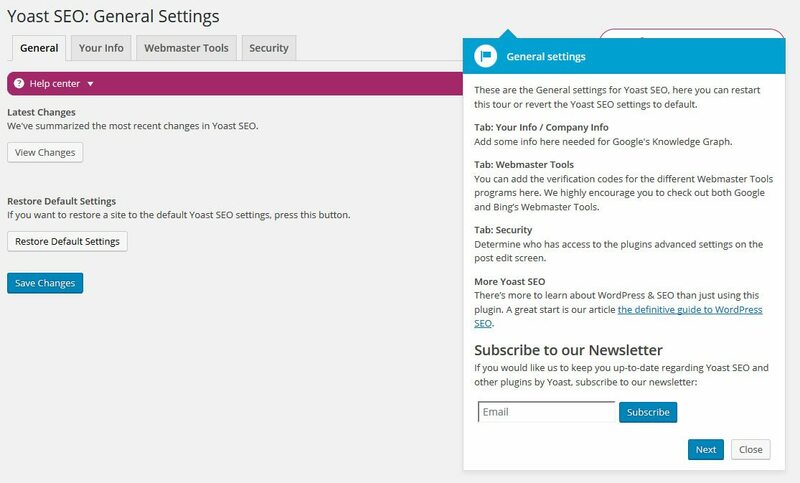 This will give you an extra menu item where you can customize a lot more settings than you get in Yoast SEO. For example, with All-in-One SEO Pack you can associate your website with an unlimited number of social profiles, control default image settings and set up Open Graph meta data for Facebook and Twitter. The plugin also supports Google+ but its settings are (confusingly) located in the general options. As can be seen, both plugins offer extensive support for social sharing and can add important information for social networks to your content. While Yoast SEO makes the setup simple, All-in-One SEO offers a lot more control yet can be overwhelming for those with less experience. Optimizing site content is the most important day-to-day task of SEO and the main function of WordPress SEO plugins. By setting up each piece of content so that it is easily digestible and understandable for search engines, they make it much more likely that it will rank high for its keyword. Both contenders have extensive functionality in this area. 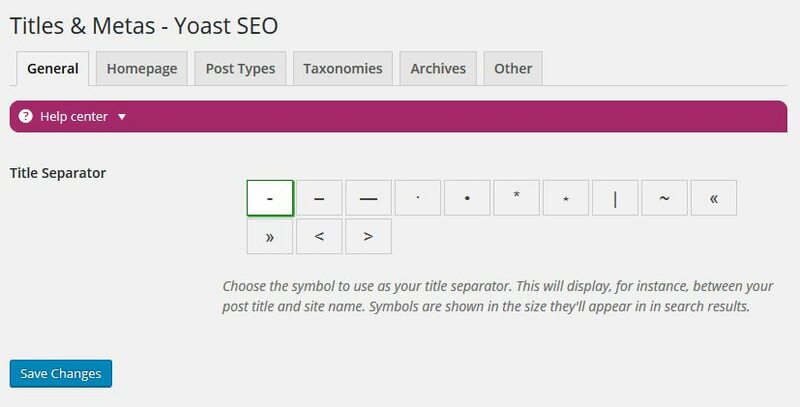 After installation, Yoast SEO adds its own metabox to the bottom of the WordPress editor. One of its functions to control the appearance of your content in the search results, by letting you edit the snippet that contains the title, link and meta description. While inputting these, the plugin will actually show you exactly how it will look for searchers later so you can make sure nothing is cut off and that the information is relevant. However, the real highlight is Yoast SEO’s powerful content analysis tool. It is actually the reason why I am such a fan because it’s kind of like having a personal SEO consultant looking over your shoulder and telling you exactly what to do to optimize your content. For it to work, you first have to put in a focus keyword (the phrase you hope to rank for on Google). Once you have done so, Yoast SEO will analyze your content for more than a dozen SEO best practices and tell you how you are doing for each of them with an easy-to-understand traffic light scoring system. 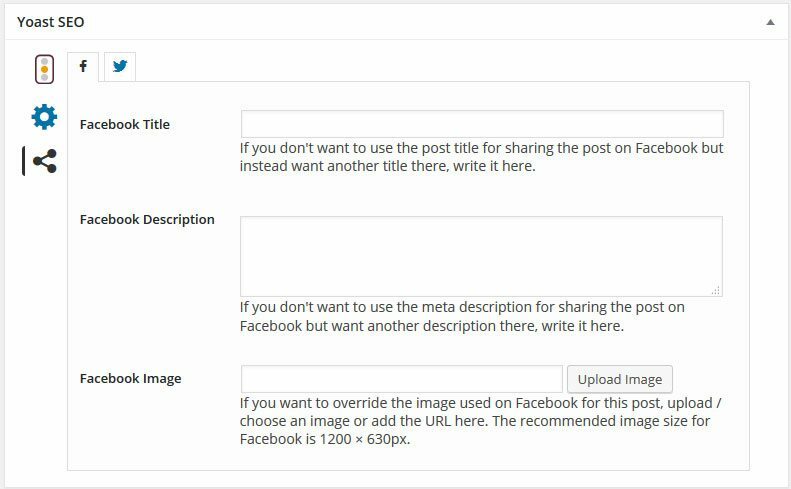 That way you can see whether you should include an image with relevant ALT tags, add the key phrase to your heading tags, increase the keyword density, article length or readability. Plus, the plugin will also give your content an overall score so you know when it is ready to publish. While you should always write for your visitors first and search engines second, this will really help improve the technical aspects of your content. In the same place, you also find two more sections: advanced settings and social. The first one (found under the gear symbol) allows you to tell search engines how to index your content, add canonical URLs and more. Beginners should stay clear of these settings unless they know what they are doing. The default is usually what you want anyway. Under the social tab, you can include custom titles, descriptions, and images for different social networks to optimize content sharing. That way, you can make sure everything is displayed optimally and can even test different titles if you wish to. 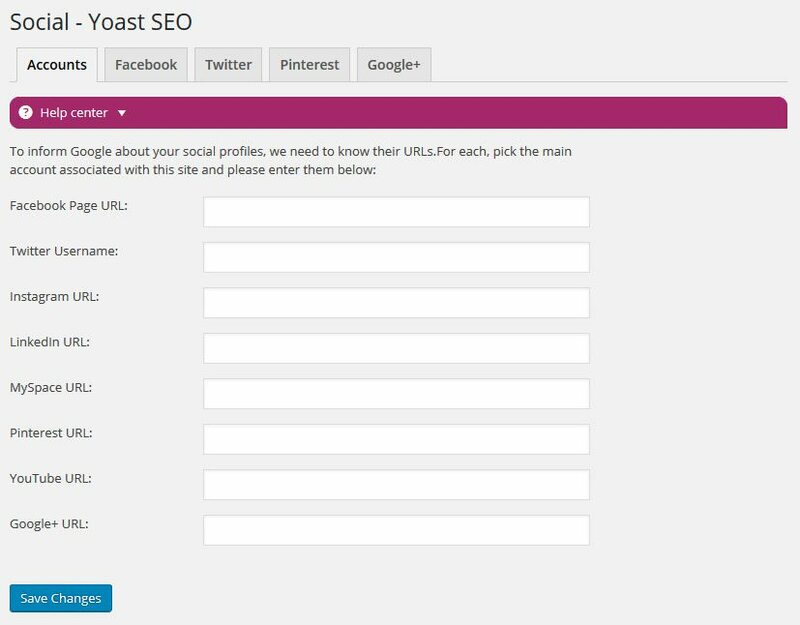 When everything is left blank, Yoast SEO will automatically use the main title and description for social networks. The second SEO plugin comes with a similar metabox but it has slightly less functionality. It also lets you edit the title and meta description and has options to disable indexing, set canonical URLs, and more. Plus, if you have activated the Social Meta add-on, users get similar options to attach custom images and descriptions for sharing on Twitter and Facebook. However, there is no content analysis tool or SEO score like in Yoast SEO. Each of our contenders make editing the output of your content in search engines quick and easy. Yet, while All-in-One SEO Pack also allows you to set titles and descriptions, it can’t hold the candle to Yoast SEO. The competitor’s content analysis delivers invaluable input for anyone not familiar with SEO and compresses a lot of knowledge in one place, giving users a huge advantage. Before you can rank at all, your content first needs to be indexed. Sitemaps are a great tool for this because they basically provide a road map of your website with all available content and tell search engines exactly how to index your site. In addition to that, they can also be submitted directly to search engines. Luckily, both of our plugins support this feature. 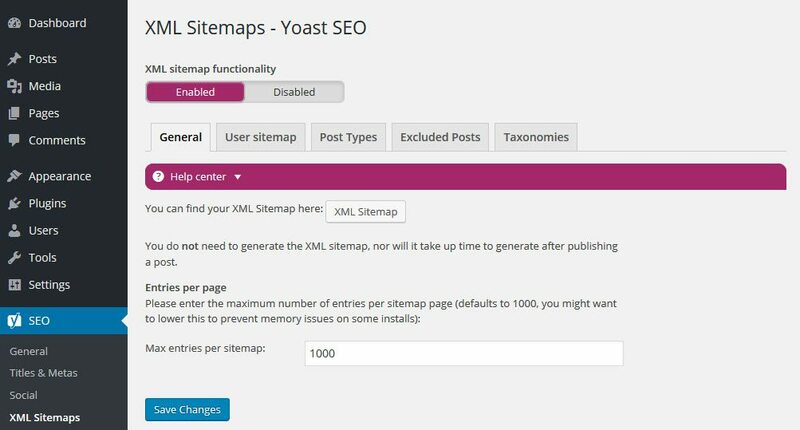 In Yoast SEO, the options for XML sitemaps have their own menu item. Sitemaps are activated by default and automatically created and updated whenever you add content to your site. Plus, the plugin will notify search engines whenever that happens. 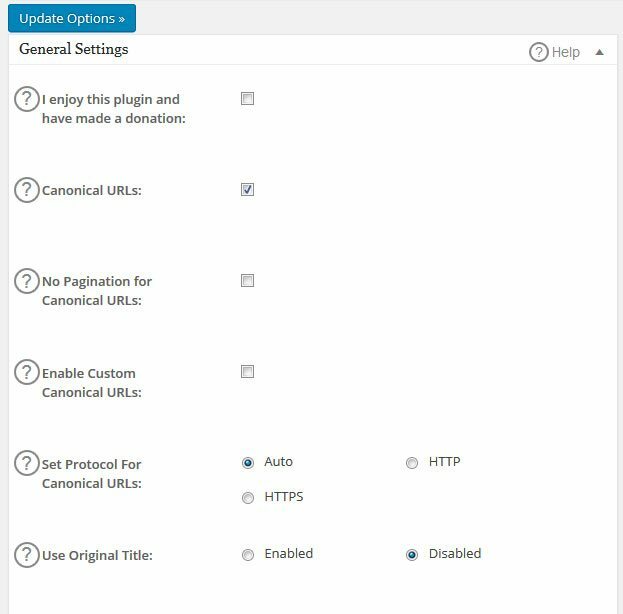 From the settings menu, you can also view your sitemap, include or exclude author archives and other post types and configure how to handle taxonomies. In All-in-One SEO Pack, XML sitemaps are not a standard feature but need to be activated from the aforementioned feature manager. 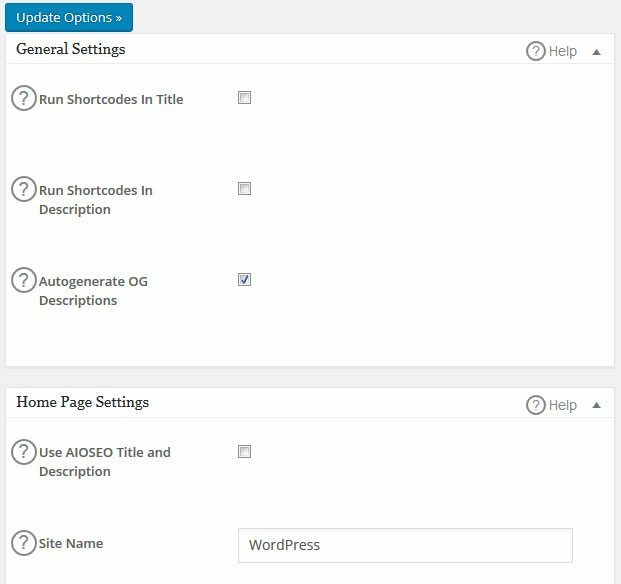 This will automatically create a sitemap and give you an extra menu item where you can configure everything to do with it. Set up which search engines to notify and how often, include and exclude parts of your content and set the frequency and priority of for crawling and indexing your site. 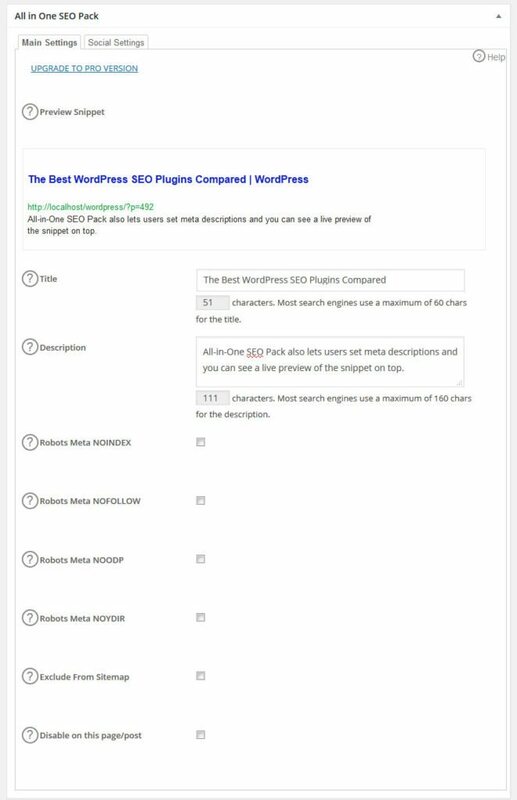 Plus, All-in-One SEO Pack has a special feature that lets you add pages to your sitemap that are not part of your WordPress site. While both plugins have XML sitemaps as a feature, their handling is slightly different. Yoast is more set it and forget it, while its competitor gives users a lot more configuration options. 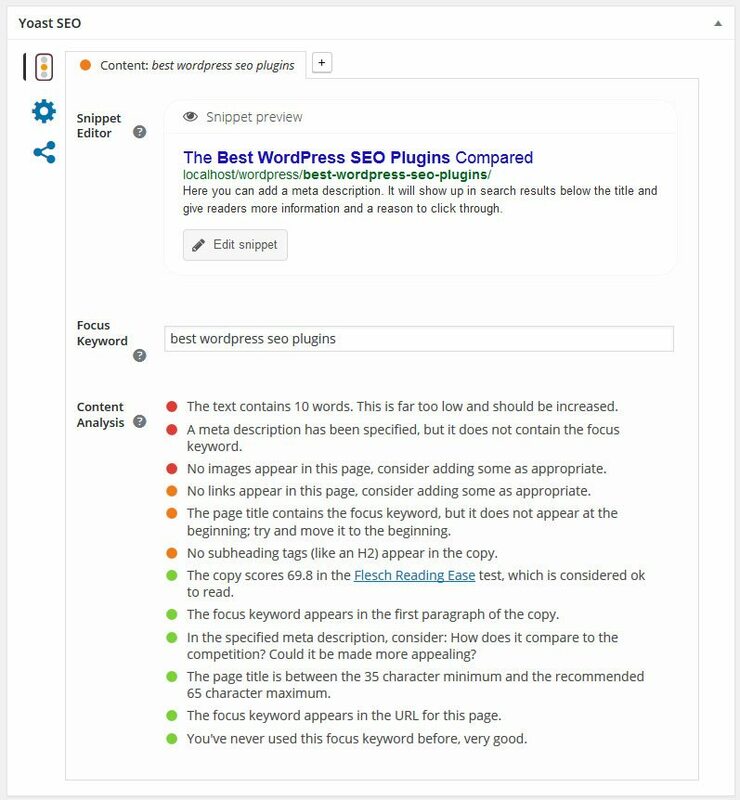 In addition to the “standard” on-page SEO features, each plugin comes with additional tools. Many of them eliminate the need for other plugins. Breadcrumb navigation — It appears to be a bit of a pet project of Team Yoast to get people to use breadcrumb navigation. However, they have a point as it improves usability and on-page SEO. Bulk Editor — Enables you to change SEO titles and meta descriptions for several post or pages at once. File Editor — A built-in text editor for robots.txt and .htaccess. Import/Export — Yoast SEO can import settings from other websites and even other SEO plugins if you are making the switch. Of course, it can export them, too. Search Console import — Connect your site to Google Search Console and see important information for how to optimize it directly in your WordPress backend. Robots.txt Editor — Lets you edit the robots.txt file from the backend and has a rule generator that helps you put together the correct syntax. File Editor — From here, you can manually edit both robots.txt and .htaccess. Import/Export — Import and export your settings to easily share your configuration with other sites. Bad Bot Blocker — Prevent bad search spiders from slowing down your site. Performance manager — Contains info about your site performance and gives you the ability to change its memory limit (which can be useful to eliminate common WordPress problems). Overall, the additional feature list is very similar. While All-in-One SEO Pack doesn’t have breadcrumbs and import from Google Search Console, it gives users more flexibility by allowing them to switch features on and off at will. The plugin also has some interesting extras, specifically in the area of performance that Yoast SEO does not have. Therefore, I see both plugins as pretty much tied in this area. While the plugins are fairly easy to use and have extensive documentation, it’s safe to say that some users will run into issues. If so, what options do they have? Plus, are there add-ons and premium features? That’s what we will look at in the last part. The basic free version of Yoast SEO has all necessary functionality to take your site’s SEO to the next level. It’s only downside however is that it comes without any online support. While you can ask questions in the help forums, Yoast SEO does not guarantee a response, so all you can hope for are replies from other users. On the other hand, the plugin’s premium version comes with on-hand support that answers half of all questions in under 30 minutes. Of course, that kind of service has its price. Yearly subscriptions start at $69 for one site and go all the way up to $799 for up to 100 websites. 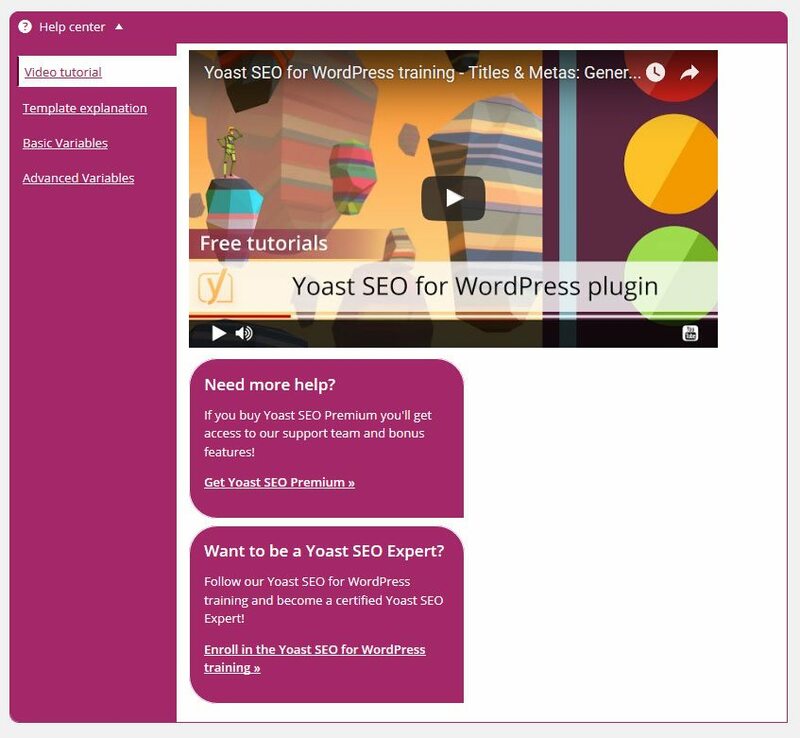 Besides support, Yoast SEO Premium also comes with additional options such as the possibility to optimize for multiple focus keywords, a redirect module and access to premium video tutorials. Video SEO (from $69) — Helps your videos rank well on Google. Local SEO (from $69) — Improve findability of your business in local directories. News SEO (from $69) — Optimize your site for Google News. WooCommerce SEO (from $49) — SEO tuning for WooCommerce-based online shops. You can also get Yoast SEO premium and all add-ons in a neat bundle for $279 (for a single-site license) and save money in the process. In addition to that, the pro edition is also usually one version ahead of its free companion. Prices start at $39/month plus $10 for support and it gets cheaper if you pay yearly or biannually. The big advantage: You can use the plugin for as many sites as you want. Every license is valid for unlimited usage. Much different from Yoast SEO. The support situation is the same for both free plugins in that there is none. Only owners of pro versions can get professional help. In both cases, support is the best argument to buy the premium version since neither plugin offers breathtaking new features for the money. Overall, if you’re gonna go pro, All-in-One SEO Pack is clearly the cheaper alternative. Yoast SEO vs All-in-One SEO – Who is the Winner? The duel between the two leading WordPress SEO plugins is pretty close. Both are excellent solutions that will do an amazing job to improve your site’s search engine optimization. Personally, I prefer Yoast SEO and use it on all my websites. I just love its content analysis feature and the plugin has never let me down. However, there are also masses of people who prefer All-in-One SEO Pack for its simplicity paired with powerful features and customization options. The decision which one you are going to use is — as usual — up to you, and depends on what you’re looking for. However, it doesn’t necessarily have to be either-or but can also be both-and. Many people use both plugins on different websites to great effect. If they can do it, so can you. Together with other SEO plugins, I am sure you can ramp up your rankings in no time. Which plugin do you prefer and why? Do you use something completely different? Please share with us in the comment section below!